What??? Boys in the girl's dorm? That never really happened, did it? 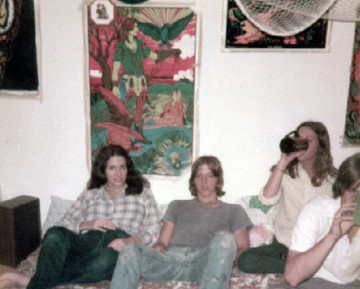 Here we have Art Copeland and an unidentified boy on the right visiting Kim Hurd's room in the South Wing in 1975. Kim is on Art's left, and is that Valerie Rubenstein to the right of Art? Would that be coffee or a soft drink in those cups? Hey, Kim, nice posters! Photo proudly sent in by Art Copeland, class of 1976.